CDR with silver label in paper sleeve. This is believed to be either an in-house listening copy for Eagle or one of a very limited run of promos for clubs. Whatever its source, it's extremely rare, and only one copy of this important CDR has ever surfaced. It features four remixes of the title track, three of which were never released commercially. 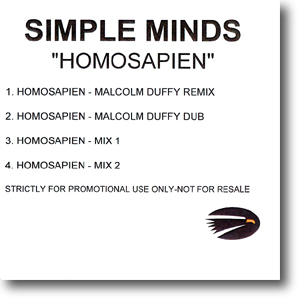 The first two tracks were slightly longer versions of the Malcolm Duffy remixes which were released commercially through Remote Recordings. The other two tracks were a radical reworking of Homosapien by Vince Clarke. The first has never been released but Mix 2 , an instrumental, was renamed The Floating World and released as the final track on the Cry album. Many thanks to Otto for the scan . This is believed to be either an in-house listening copy for Eagle or one of a very limited run of promos for clubs. Whatever its source. 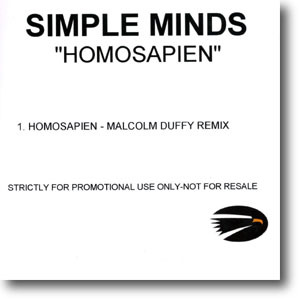 As it included one of the remixes which was eventually commerically released - after a slight edit - then it's believed this was a later pressing to the four-track version above. Many thanks to Lionello and Fabian for the scan .